Most homeowners have a very limited range of knowledge when it comes to their roof. We’ve compiled 5 questions you can ask yourself before getting started with a project. They are 3 roofing facts every Arizona resident needs to know. 1. If you have an asphalt shingle roof, when should it be replaced? There are quite a few different ways to be able to tell this. The first thing that should be considered is the age of the roof. If your shingle roof is approaching 20 years of age chances are very high that it will need to be replaced. But this doesn’t mean younger roofs are immune to the elements. So it is of vital importance that you perform routine maintenance on your roof at a clip of once per year. There is no need to hop on a ladder and go up top, you just need to get close to the roof and a pair of binoculars can do the trick just as well. This way you can stay on the ground but be perfectly able to spot any damage on the top. Are the shingles cracked? Is there some of them missing? Look out for shingles that are curling up around the edges. Smooth, dark areas on the shingles are a sign that the protective granules are wearing away. Another tried and true method for detecting damage involves heading up to the attic, turning the lights off and checking the bottom of your roof for small holes that allow light to seep through. After a good rain it may be a good idea to check for wet areas, or soft spots. If you notice any of these things then it’s time to call in a professional roof repair in Goodyear. 2. Are you better off going with a shallow, pitched roof, or a steep pitched roof? As with any questions, there are upsides and there are downsides. If you purchase or own a steep pitched roof then you will find that it is far less likely to collect debris that may accumulate on your roof. Many times they hold moisture against your shingles and promote moss growth. And you have to take into consideration that a steep roof is going to be in direct contact with the full force of the sun. This type of beating is almost always fatal, no matter what type of roof you own. There are many reasons your shingles could give way, such as the side of your roof that gets the worst weather is going to fade away faster. No matter what type of roof you own you are going to need to install a proper ventilation system in order to prevent heat from accumulating underneath the roof. This will assuredly extend the life of your roof. There are joints on your roof, places that make it easy for water to collect of seep through. Flashing is usually a metal material affixed to your roof where these joints occur, or at the base of your chimney. It acts as a barrier between the elements and the inside of your house where the roof may not be able to divert rain and other materials. It’s not the same for every roof, but flashing can be put in the valleys, around pipes, skylights and dormers. The elements can take their toll on the flashing, such as oxidizing, which can in turn affect your roof profoundly. Be sure to check your flashing regularly to make sure it has not been compromised or come loose. Well those are our 3 facts that every Arizona resident should be aware of. Remember, routine maintenance and repair is going to end up saving you so much more money in the long run than not taking care of your roof. A full replacement can be costly, so do yourself a favor and be sure to contact the professional Goodyear roofers at Arizona Roof Rescue for all of your roofing needs. We have the experience and qualifications necessary to do the job right. And our customer service is second to none. So don’t let just anybody work on your roof, go with the best. 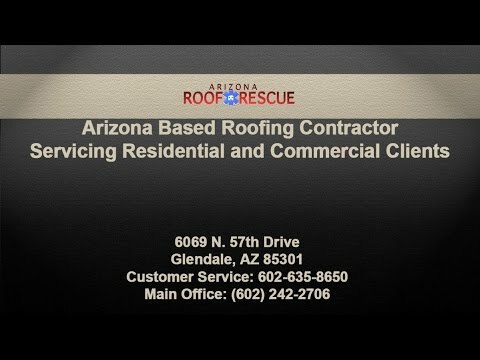 Go with Arizona Roof Rescue today.